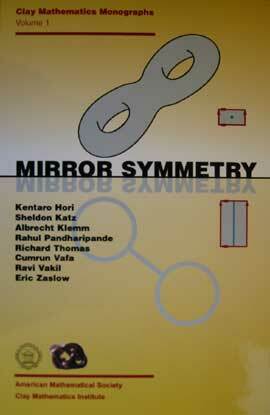 This book is a product of a month-long school on mirror symmetry that CMI held at Pine Manor College in Brookline, Massachusetts in the Spring of 2000. The aim of the book is to provide a pedagogical introduction to the field of mirror symmetry from both a mathematical and physical perspective. After covering the relevant background material, the main part of the monograph is devoted to the proof of mirror symmetry from various viewpoints. More advanced topics are also discussed. In particular, topological strings at higher genera and the notion of holomorphic anomaly. This book, a product of the collective efforts of the lecturers at the school organized by the Clay Mathematics Institute, is a valuable contribution to the continuing intensive collaboration of physicists and mathematicians. It will be of great value to young and mature researchers in both communities interested in this fascinating modern grand unification project. It is the first book on the subject which tries to put together the mathematical and the physical aspects of mirror symmetry in a systematic way, and it has inherited the pedagogical style of the school where it originated. The book is an excellent starting point for learning the subject. It provides an extensive background for both mathematicians and physicists. It is also the most updated book on the subject, and it covers more recent developments like Gopakumar-Vafa invariants and geometric transitions. The style is clear and pedagogical, and many exercises are included in order to develop the technical skills of the reader. In conclusion, the book will certainly be the key reference on the interface between mathematics and physics in mirror symmetry for years to come, and it is highly recommended to anybody willing to learn this fascinating topic.